Auto Club: Thank You Southern California! (LOS ANGELES, June 30, 2006) — Southern California motorists and others have helped to make a difference in our environment and at the same time send more than 300 low-income children to Southland beaches this summer. 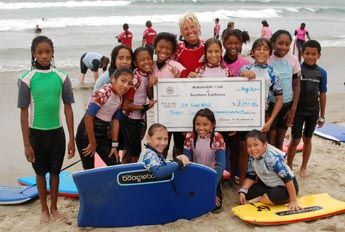 LA Surfbus Director Mary Setterholm, center, with children from San Pedro attending surf camp in Huntington Beach. With the help of Auto Club members and AAA Great Battery Roundup campaign proceeds, the Surfbus program was able to expand into Orange County (HB Surfbus) and bring 300 children to Southern California beaches this summer. contractor recycling sites established by the Automobile Club of Southern California and AAA?s Great Battery Roundup? campaign. The Auto Club estimates the battery recycling effort removed 44,037 pounds of lead from the environment and sent it to recycling plants where new batteries can be made. The AAA Great Battery Roundup” in Southern California earned more than $3,145.50 in a recycling rebate, which will be distributed to LA Surfbus to give more than 300 low-income children across the Southland a first-time beach trip combined with environmental education. The funds will allow LA Surfbus to expand into Orange County with “HB Surfbus” taking 100 Huntington Beach children and approximately 50 San Pedro children to Seapointe Street/Dog Beach, Huntington Beach, in two buses beginning Thursday, July 6. ?Vehicle batteries are one of the most frequently replaced automotive components, but require special care and handling for safe installation and disposal,? said the Auto Club?s AAA Battery Service Manager Bill Howell. ?The Auto Club thanks and congratulates all the motorists, airplane and boat owners in Southern California for being environmentally aware about used batteries, and taking the time to donate them for a worthy cause.? The used batteries of the Auto Club?s fleet vehicles also are quickly returned to a recycling plant. Motorists needing assistance with their vehicle battery may continue to call the Auto Club for assistance from the AAA Battery Service. Each year, the Auto Club responds to 800,000 member calls for battery problems.